This is a very nice Motif XS6. Everything works perfectly and it has the newest OS already installed. It is in near mint condition cosmetically with just a couple of small scuffs and scratches that you should expect on a used keyboard. The screen is bright and clear and there are no broken keys and they all play just as they should. Photos are of the actual item. With the new Yamaha MOTIF XS, inspiration is just a key press away. High-quality sounds to inspire you, intelligent arpeggiators to fuel your creativity, recording features to capture every idea, built-in sampling to create full audio/MIDI arrangements, rhythmic Patterns to compose with, studio-style mixing controls and versatile effect processing to master your final productions. With all this and more, the MOTIF XS will soon be your favorite 'goâto' instrumentâwhether you're composing at home, recording in the studio, or playing live. It's got absolutely everything you need to make professional quality music. Close your eyes, play the gorgeous sounds and rhythms of the MOTIF XSâand feel the inspiration. The MOTIF XS provides an exceptionally broad selection of realistic sounds to spark your creativity, with a massive 355 MB of high-quality waveforms and samples on board. A single Voice can have up to eight separate sound Elements, enabling composite sounds of remarkable complexity and nuance. Among the standout Voices is a resonant, meticulously recorded concert grand piano sound that is practically worth the price of admission by itself. New acoustic piano, electric piano and orchestral samplesânot to mention the richly textured and distinctly electronic synthesizer wavesâgive you the sonic tools to fully realize virtually any style of music and any instrumentation. Another new feature is the Expanded Articulation (XA) tone generation system. Using the eight available Elements, XA allows you to more effectively recreate realistic sound and natural performance techniquesâsuch as legato, staccato and key release soundsâoften used on acoustic instruments but unavailable or difficult to realize on electronic keyboards. It also lets you assign Elements to on/off panel switches, and change sounds within a Voice in real timeâfor example, playing a classical guitar voice and switch between playing normally and playing high harmonics. XA also offers other unique modes for random and alternate sound changes as you play. A wide selection of special Mega Voices provide even more expressive nuance, when used with sequencer tracks or the special Mega Voice Arpeggios. Mega Voices are not meant to be played from the keyboard because of their complex velocity layers, but have special expressive sounds that are designed to be precisely triggered by recorded dataâfor example, letting you create an acoustic guitar track with authentic sounding muted playing, slides and bell-like harmonics. Another powerful feature is the Integrated Sampling Sequencer, which seamlessly combines audio and MIDI recording. Simply install optional DIMM modules (up to 1 GB) and record the audio directly to tracks on the MOTIF XS. Record your vocals or acoustic guitar (with a microphone), electric guitar or bass, or even short rhythm loops from a sample CD. There's also a Slice feature that automatically chops up your rhythms and riffs into their individual beats and notes, letting you manipulate the component parts of your sample loops as MIDI dataâgiving you the power to easily change tempo and rhythmic feel, without disturbing the pitch or sound quality. The MOTIF XS is not only exceptionally intuitive and easy to operate, it's a true joy to playâright down to the newly designed expressive keyboards. The MOTIF XS6 and XS7 have a new, natural FSX keyboard (61/76 keys), while the MOTIF XS8 features the grand piano-like BH (Balanced Hammer) keyboard (88 keys). A full-featured music production synthesizer in every way, the MOTIF XS comes equipped with a variety of connectors and interfacesâfor virtually any application and any studio situation. These include independent Assignable Outputs, A/D Inputs (for recording external sources), S/P DIF Digital Output, MIDI, Ethernet, IEEE 1394 (standard on the MOTIF XS8 and available on the MOTIF XS6/7 with the optional board) and two USB connectors, compatible with the high-speed USB 2.0 standard. The comprehensive set of connectorsâEthernet, IEEE 1394 and USB TO HOSTâmake interfacing with computers and your favorite software exceptionally easy. In particular, the new Ethernet connection gives you fast transfer of your MOTIF XS files to and from a computer on the same network. The IEEE 1394 interface gives you a one-cable, one-network solution for highâspeed, realtime transfer of multiâchannel digital audio and MIDI data. Today's music production is highly dependent on software, and the MOTIF XS is designed to work seamlessly and transparently in your computerâbased environment. The Remote Control mode lets you control your DAW software right from the panel of the MOTIF XSâfor example, starting and stopping playback/recording with the special transport buttons, changing track levels with the sliders, and tweaking parameters with the knobs. The MOTIF XS is also compatible with the MOTIF XS Editorâa comprehensive, easy-to-use editing software program that lets you edit (via USB connection) the Mixing setups and Mixing Voices to be used for Song/Pattern playback directly on your computer. The MOTIF XS Editor is free and can be downloaded from the Yamaha website. 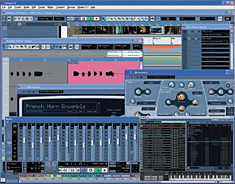 Naturally, the editor can be used within Cubase as part of Studio Connections, and all settings can be saved with each project for instant recall. If Cubase is not yet part of your software arsenal, a copy of the new Cubase AI is bundled with the instrument, letting you dive in and start using the versatile features of Studio Connections right out of the box. Cubase AI is a full-featured music production software that integrates fully with the MOTIF XS, and can easily be upgraded to Cubase 4. It gives you all the tools to produce professional level recordingsâquickly and easilyâwith a system that you can expand into the future. The MOTIF XS is specially designed to function seamlessly with Cubase 4, Steinberg's powerful DAW softwareâgiving you a comprehensive, all-in-one music production system in which both hardware and software are fully integrated. With our Studio Connections system (created jointly with Steinberg), you can effectively bring the MOTIF XS into the Cubase environment and use it just as if it were a plug-in software synthesizerâno complicated connections or complex setup necessary. Whenever you open a project, your MOTIF XS is automatically enabled as well, with all the custom settings you previously saved. You can use the convenient panel controls on the MOTIF XS to remotely to control a wide variety of operations on Cubase 4. And since song files on the MOTIF XS are in Cubase format, you can create material on the MOTIF XS and easily import it to tracks in Cubase 4 for further editing and mixing. Preset: Approx. 6,000 types User: 256 types *MIDI Sync, MIDI transmit/receive channel, Velocity Limit, and Note Limit can be set.